Susie, The Life and Legacy of Susannah Spurgeon by Ray Rhodes Jr., Moody Publishers, 2018. My book reviews can be rambling and interactive, so I will begin with a brief overview. I enjoyed this book, and was touched, encouraged, and challenged by Susie’s life. This biography brought her to life, especially considering the challenges involved when writing about a dead historical figure whose immediate progeny have also passed off the scene. The book proceeds chronologically, each chapter moving you forward in Susie’s life. My only minor critique is that sometimes in the book there would be sentences that seemed repetitive as it summarized something about Susie. Other than that, I can only offer positive remarks about this excellent book. Besides the content of the book, the book itself is a quality hardcover with a section of photographs. I think some publishers today are too cheap to include photos, so thanks to Moody for this bonus. 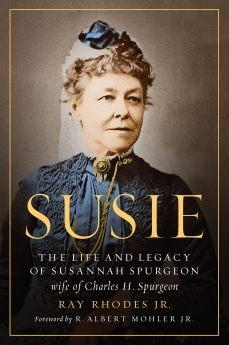 A unique feature of this biography is the epilogue entitled “The Legacy of Susannah Spurgeon” that highlights principles of her life that we can learn from and apply to our own lives. Other biographers out there, take note! This is a great idea! I also appreciated a two page afterward written by Susie’s great, great granddaughter. The life of Susannah Spurgeon has remained in the shadows of her famous preacher husband Charles. I am glad this book was written to highlight her life. Charles was a gifted preacher and writer, but it is really through the efforts of Susie that his work lived on. As you learn in the book, Susie had a book ministry, both while Charles was alive and after his death, where she widely distributed his sermons and books. Her work in the shadows played a significant role in Charles not drifting into shadow! His legacy remains strong today. 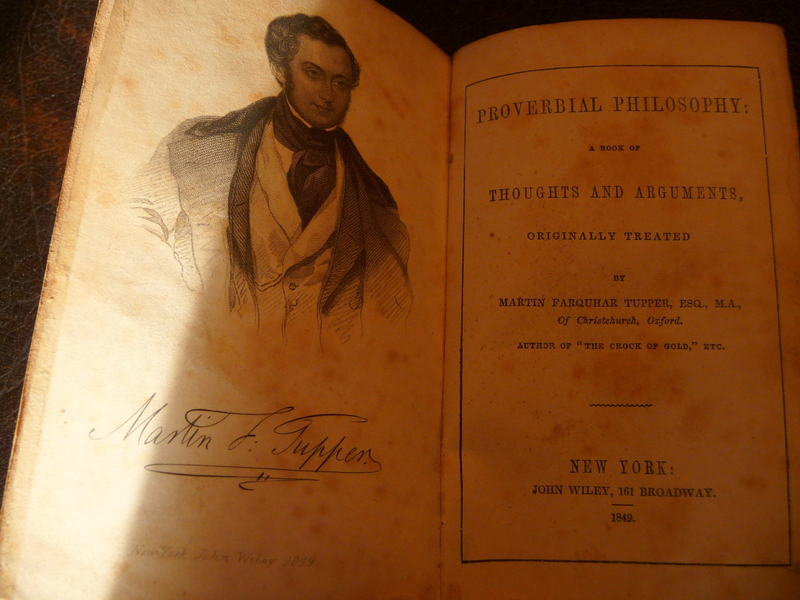 Before Susie and Charles were married, Charles hinted at his intentions by handing her a book – Martin Tupper’s Proverbial Philosophy – and pointed out the section about marriage. This was in 1854. I was a bit startled to see this book. Why? Well, I have a copy of this very book, an 1849 edition! It belonged to my great great grandmother. She signed her name and date in the book (1854 or 1859), and it was passed to her son – my great grandfather. And so on, and now I have it. Several photos and details in this post, but here is one photo: Books, reading, and writing were an important part of the Spurgeon household. Charles had a library of 12,000 books! Page 141 of the biography states “Much of Charles and Susie’s relationship was cultivated in his study as she joined him on Saturday evenings to assist him in sermon preparation by reading to him from commentaries.” Susie saw how important a good library was for sermon prep, and she “mirrored Charles’s book-important attitude” (page 143). Susie had an extensive ministry of distributing biblical books to poor pastors in England who could not afford books. I relate to this book-important attitude and have a large library of biblical and theological books. (Maybe 2,000? I’ve never counted.) Some were passed on to me from my parents who were students of the Scripture. My dad was a Bible teacher and preacher. Other books I acquired myself as I worked on a seminary degree, and as I continue in personal study. I do adult Bible teaching as well as substitute preaching, and this would not be possible without my many books. I understand the importance of Susie’s book distribution ministry. Several people close to me will be amused to read that paragraph, as they will clearly see me in it. As the church librarian for a few years, I was horrified by some of the books donated to the church library. Like Susie, I minced few words about the lack of discernment and worthless books. I also discarded them! Finally, a few rambles about the marriage of Charles and Susie. While in some aspects they reflected the Victorian Age, in many ways their relationship did not. To use modern terminology, and as someone who identifies as an evangelical egalitarian, I would describe their marriage relationship as quite egalitarian! There was real give and take. Susie was a great help to Charles, but Charles was also a help to her. There was a distinct mutuality. Their roles in the home had a degree of flexibility depending on circumstances. Page 136 in the book states that: “Charles detested any postulating that the husband was the center of all things. He denounced men who believed that their wives exist for them…” – This was refreshing, and I was impressed by their marriage as portrayed in the book. Again, I recommend this book. Thanks for reading my review and related thoughts. ⇒ If you appreciated this book review, consider sharing it. Click below. ⇒ Perhaps you’d like to further explore the blog? Or subscribe? See the right column at the top, to subscribe. Great review, Laura. I’ve shared it on a book-themed group board on Pinterest and on Twitter. Thanks so much – for reading the review and sharing it too! Hi Laura. I’m thinking of requesting that book for my next Moody review book. But there are other options, like a John MacArthur one and a book on the solas. Your review gave me more food for thought for this decision! What you said about being church librarian stood out to me. I am downsizing some of my library, and I am donating some books to the library of the church that I ordinarily attend. I decided to donate to the church library the academic theological books, while donating the Christian fiction and Christian popular stuff to the Goodwill. I just figure that people can get popular stuff at the Goodwill if they want it, but it would be great for the pastor and congregants to have access to theological material at the church library. Yes!! The church library needs quality biblical and theological books. The fiction and popular stuff is easy enough to find elsewhere, and church libraries can, sadly, end up overflowing with such. I am glad my review caught your eye since you are a Moody reviewer! If you decide on it, I’ll look forward to your review. As you could see from my review, I related to Susie in various ways. Sounds like a wonderful read. Thanks for reviewing. God bless!